You are no doubt aware of the Nightmare on Elm Street movies and their popularity. As graphic and controversial as they are, there's one thing that keeps the public coming back to sequel after sequel: suspense. If you can keep people on the edge of their seats with "things that go bump in the night" and such, you'll have a hit. Dungeon Master, a slick, new adventure from FTL Software, has taken the ST world by storm. "New is a relative term as ST users may recall a demo FTL released—about two years ago—that first demonstrated what they were working on. It showed up in the databases of the ANALOG/Atari SIG on Delphi in June of '86 as the Firestaff Demo. Since then, they've switched to a different language, for added speed, and it's obvious they haven't wasted any of that time. The final result is a suspenseful blend of strikingly colorful graphics and strong action, but by far the finest aspect of DM is that feeling of fear and apprehension you get wondering what's going to pop out from around the next bend. Countless DM enthusiasts—and my hand is raised here, also — have admitted to actually being startled by a surprise visit from one of the ghoulies lurking in the multitude of rooms in the castle. The software takes quite a while to load, understandably due to the custom routines FTL has employed to get more than 16 colors on the screen at once, as well as the size of the castle you'll be rummaging through. The added hues are used to smooth out the shading of the surroundings, but, most importantly, to make the assaulting creatures look as life-like as possible. And they do! Couple that with the digitized sound effects, which accompany each offensive attack you or the monsters initiate and you get the spirit of being there. For instance, they've even added comical "gulps" and "ooofs" when you eat something or accidentally run into a wall with your party. Having one of your party killed off brings a heart-wrenching moan from the monitor speaker; an audible assist as you will probably be too busy slinging your weapons in combat to see that member's health indicator bars drop down. It's an involving experience, to say the least. At the onset of the contest, you wander through the Hall of Champions, a chamber of characters who have failed in their past attempts at defeating the evil Lord Chaos. As the story that accompanies the documentation attests to, you are a young apprentice to the Grey Lord. As you further discover, Theron's mission is to oversee four heroes in the quest to retrieve the Firestaff, a stepping stone to defeating Lord Chaos. Each Champion has their portrait hung on the wall of the chamber and clicking on the picture brings a screen detailing their attributes and cache of weaponry. You can restore them as they are, or resurrect them under a different name, though at a lower ability level. As with most adventures of this genre, you gain experience points in certain areas, or actually avocations—such as Priest, Wizard, Ninja, etc.—as you successfully fend your way deeper in the maze of rooms and levels. Also, as is common in this kind of gameware, you gather necessary components —be it a weapon, key, informative scroll or vital nourishment, among other items—to keep the party healthy and on top of the onslaught. So as not to discourage the novice adventurer, the first levels are the easiest—providing a nice, smooth learning curve for getting used to the surroundings of the castle and the software's controls—with each successive level adding more opposition in the way of harder-to-kill meanies and intricate mazes. I've victoriously battled my way into level 4, though I've been told I have a ways to go; there are in excess often levels, enough to keep a player busy for some time. I think icon, I think icon. . . . Playing DM is a treat in comfort; everything is icon-driven and mouse-controlled, so there's no call for any typing (even if you choose new names for your champions at the start). I've always found the burden of typing commands in text adventures to be a tedious exercise that generally accounted for my past apprehension over playing them. Also unlike text adventures, picking up an object is as simple as moving the mouse pointer (in the shape of a hand) to the object on the screen and clicking; click again to drop it. You can even use the acquired item as a weapon by holding its icon in the center of the screen and clicking, which causes the character holding it to throw it. The viewer accurately shows the perspective of how your party views the area around it; if items or creatures are down the hall a bit, you'll see them in their 3-D rendition. And those surroundings are nicely garnished with occasional embellishments, like a patch of algae or missing mortar on the walls and puddles on the floor for added realism. If you need a bite to eat, just click with the right button on the icon of the selected champion at the top of the screen, click on the object you want in the backpack (which holds 17 objects per party member), carry it to the mouth icon and click. 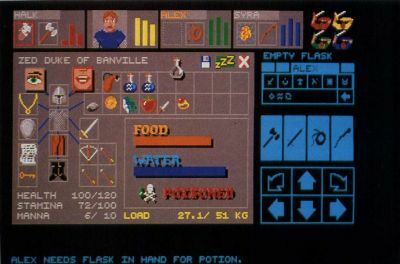 . . glup. . .and the player's food indicator bar jumps up to a more acceptable level; the same occurs to satisfy thirst. You also have areas on-screen for the preparation of weapons or magical objects. There are two hand icons for holding objects, and placing an item in the right hand enables it for activity, like slashing with a sword or flinging a throwing star. As well, there are pockets for holding small objects (like a compass or rabbit's foot) and locations for clothing and armor (such as a helmet or chain mail). One other essential thing you have in your defensive favor is magic spells. At the far right of the display, there is a box with symbols in it and four buttons, each with the name of the party members in it. Clicking on one of the names and following that by selecting (also with the mouse) a series of symbols will have that person chanting matching spell syllables. Certain combinations of symbols effect different results: fireballs, poisonous missiles, a mystical torch for lighting your way, healing, etc. The higher the level of "mana" your characters have, the stronger and more frequently they can recite the incantations with better results. I know all this sounds overwhelming, but keep in mind that learning to use any complex piece of software can take a little bit of getting used to—keep in mind, it's the program itself that's complex, not the actual use of it. As I alluded to before, FTL has provided ample room for getting the hang of the user interface, while risking very little damage to your party. Dialog boxes for saving the game to disk lead your way easily to insure you don't waste your efforts. The only complaint I can make is that you can't reload a game on the fly; only at the start of a new session or when all of your party members have bitten the dust. There are times, if you know you are faring poorly, that you wish you could get a fresh start on the scenario, but for now it's not supported in DM. That's too bad, because you'll find yourself reloading your game saves over and over, due to the ruthlessness of a terribly challenging variety of attackers. There are mummies, oversized mushroom creatures called Screamers, poisonous purple worms, and many more. All of this gets more intense as the contest rages on. And to reiterate, the graphics and animation of these beasties is fabulous: flailing arms, fang-filled mouths and slithering bodies slinking around the maze at every turn. According to Wayne Holder, President of FTL, the work that went into the DM software will result in a toolbox of sorts, giving them the ability to create other adventures in a multitude of venues. 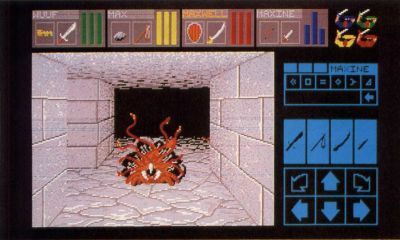 Changing the graphics data file, for example, can alter the arena of play from the DM castle to deep space. This configuration will permit them to come out with these games quicker, cleaner and cheaper than a product that starts from scratch. Holder stated, albeit optimistically, that their intentions are to bring out four to six games of this sort each year, with the first one coming after they work all the wrinkles out of this potentially powerful development system—possibly by the end of 1988. Keep in mind that you can't possibly get the feel of how well the game looks or plays, or understand all the nuances of the product by just reading the ran tings of this satisfied reviewer. My advice is to run to your nearest computer store and buy a copy of this gem to see for yourself. As I'm sure you'll agree, it's worth every penny. In your haste though, don't forget one thing: keep an eye peeled for movement around each and every corner, just to be safe...you never know what's hiding there!